About 200 protesters opposed to U.S military action in Syria picketed U.S. Sen. Amy Klobuchar's office in Minneapolis on Tuesday afternoon. President Barack Obama has asked Congress to weigh in on using military force following a chemical attack the administration said was linked to Syrian President Bashar Assad's government. One of the protesters, Neil Fagerhaugh of Hugo, said he'd like to see Klobuchar strongly oppose the resolution, especially in the wake of U.S. wars in Afghanistan and Iraq. "I don't want any type of action limited or otherwise," Fagerhaugh said. "When they say it's going to be limited, that's a guess -- they don't know what the responses are going to be from other interested parties." 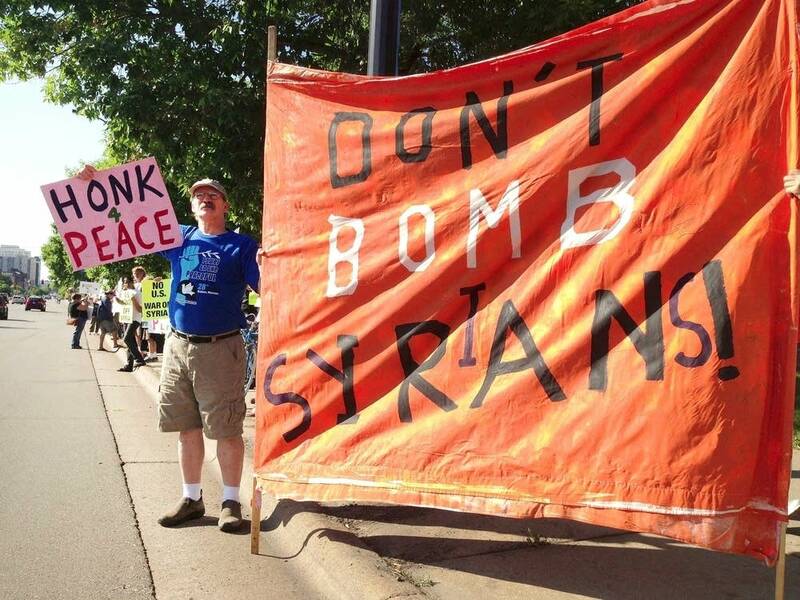 Margo Casey of St. Paul said bombing Syria would be ethically wrong. "Enough people have died and I think it would just unleash a terrible disaster in all of the Middle East," Casey said. "We just seem to be on a course of endless war, and that needs to stop." Although Klobuchar was in Duluth on Tuesday, her staff circulated with protesters during the demonstration. In a statement released on Tuesday afternoon, Klobuchar said she welcomes Minnesotans' views on Syria. "The decision to allow Congress to debate will give us the ability to carefully consider the evidence before making a decision," Klobuchar said. "I believe the current draft of the resolution is too broad and I continue to strongly believe that we should not have American troops on the ground in Syria." Meredith Aby is a member of the Anti-War Committee, which helped organize the protest along with a coalition of other groups. She said the coalition will continue to organize protests to pressure Minnesota's congressional delegation as the votes approach. "If people agree with us, people should call their members of Congress," Aby said. "They're going to need to make an important decision in the next week, and if people have opinions on this and are being silent, they're doing themselves and the people of Syria a disservice." Democratic Reps. Rick Nolan and Collin Peterson, and Republican Rep. Michele Bachmann have all said they're opposed to military action in Syria. U.S. Sen. Al Franken is the Obama administration's strongest supporter in the Minnesota delegation. He recently told MPR News that the Syrian government shouldn't be allowed to violate a ban on the use of chemical weapons. Congress is expected to consider the resolution authorizing military force in Syria soon after they return from break on Sept. 9.